"A device which is in the top of its class"
"The N5200B PRO is a mature and robust product that provides consumers a 'safe' central place to store data. For SMEs, this product may be a very interesting alternative to the expensive storage servers from established brands like HP and Dell. Especially because of the performance and redundancy through the network, the N5200B PRO is very suitable." "The N7700 is one heck of a NAS box if you need something to take seven drives and have nowhere to put a rack mount unit." "The Thecus N5200B network attached storage device is a utility that many users will not be attracted to while others will fall in love with the features and advanced control that it offers over other cookie-cutter NAS units on the market. Support for two different Gigabit Networks and 5 3.5-in hard drive bays really give the N5200 a unique stance in the market and if you can swallow the somewhat surprising price this Thecus NAS could find a cozy spot on your network." "It's fast and reliable. The Thecus N5200 is one hell of a NAS"
"I have to say the N5200 is a really great, great NAS. I haven't had too much experience with NAS devices before but I've always wanted one. As a developer and a media enthusiast, I wanted something to keep all my files in one place for easy access with some redundancy. So far after a few months I haven't run into any problems what so ever. I made the device shuts off during the late evening and turns on during the morning and it hasn't failed me yet. I even plugged in another eSATA drive while it was running and the N5200 found it without any issues. 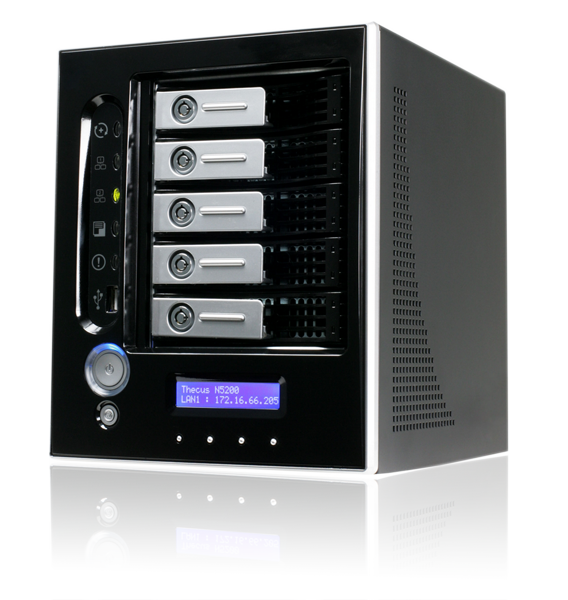 The Thecus N5200 provides that and more with a very small footprint, quiet operation, expandability through modules, and impressive performance." "Shames direct competitors, not only in performance, but also features"
"The Thecus N5200PRO is from a technical point of view very clearly a product for business users. All the more amazing is that this is not a high price to pay. 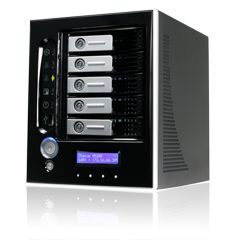 In fact, the N5200PRO is not only the fastest NAS in its class, but also among the cheapest…. [The N5200PRO] shames direct competitors, not only in performance, but also features…All in all, the N5200PRO, is the perfect device for every pragmatist." Back up all of your data or just the folders you choose from your NAS onto an external disk through your USB or eSATA connections. Create and edit fixed, specific backup processes for regular automatic backups or manually back up when you choose.